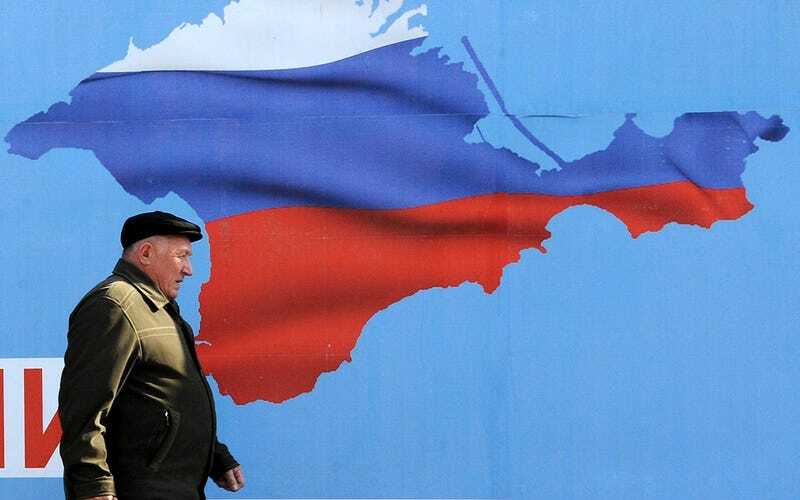 The Russian Parliament today approved the incorporation of Crimea into Russia. So much for Putin's promise that he wasn't going to annex the region. As I've said before, I think Crimea is, at best, a consolation prize for Russia. I don't think they really want it, especially considering how strategically vulnerable it is. They certainly want access to it, since it's a pretty valuable staging point for their Black Sea fleet as well as for trade in the region, but holding it without also occupying Ukraine itself would be something of a quagmire. Russia's real goal is to force the Ukrainian government into backing down and accepting Russian hegemony again. That being said, this isn't something Putin can easily take back now. He can't just say "oops, we really didn't mean it, sorry Ukraine." So it's clear that the situation has escalated; the Russian government has decided that the Ukrainian government won't bend given current circumstances and so is willing now to treat them with overt belligerency, rather than the faux civility which they've been dealing out previously. So this is by no means the end to the crisis; it may well be just the beginning (unfortunately). In all fairness to Putin, he has a point: the United States and the other Western powers are a tad inconsistent regarding the principles of self-determination and territorial integrity. The truth of the matter is that the two principles are self-contradictory; you can't respect one without occasionally ignoring the other. Kosovo is something of a special case because of the war of genocide that preceded its occupation and subsequent separation from Serbia, but special cases do have a tendency to set a precedent for more special cases. Of course, this is all ignoring some very real questions about the legitimacy of the Crimean plebiscite, considering that A) ethnic Russians only make up 60% of the population and the "yes" vote was an overwhelming majority despite significant Ukrainian and Tatar opposition and B) the peninsula is under Russian occupation, with Russian soldiers overseeing the vote.